Many of you anxiously followed the proceedings from the Special Called Session of General Conference in St. Louis. These past few days have been emotionally difficult for every one of us. My heart broke watching fellow United Methodists fail to find a new path forward that breaks through the impasse that we’ve experienced in our church over the past 47 years over LGBTQ inclusion. We had many difficult and public conversations about issues that are tied to our identities as United Methodists, as Christians, and as children of God. For those of you who have not followed the details, I offer a brief explanation of what happened over four days in St. Louis. After a full day of prayer, the 864 delegates from across the global church received the report of the Commission on a Way Forward, including the One Church Plan (which was recommended by the Council of Bishops), the Connectional Conference Plan, and the Traditional Plan. The General Conference decided to give priority focus to the Traditional Plan and the One Church Plan. After two days of debate, the One Church Plan was defeated, and the Traditional Plan was supported by a vote of 53% to 47%. The Traditional Plan keeps the current language regarding homosexuality in the Book of Discipline, and streamlines the processes to enforce penalties for violations related to marriage and ordination of LGBTQ persons. A number of elements of the Traditional Plan, however, were have been found unconstitutional by the Judicial Council and the whole plan will be reviewed again at the council's meeting in April. This means some or all of what was approved may not actually take effect. During the weeks to come, I’ll be meeting with various groups to process what the decisions mean for us. So, what does all this mean for the mission of Christ through the churches and people of the Rio Texas Conference? First, I continue to count it an honor to serve as a Bishop of the United Methodist Church, and especially of the Rio Texas Conference. My task is to help us order our life together as a conference and to focus our work on the mission of Christ. No matter how you may feel about the decisions of the General Conference or whether you agree with or are hurt by the outcome, we are still in ministry together. All of us are valued parts of the body of Christ. Our lives and ministries are interwoven by the Holy Spirit, and not by decisions made at General Conference. As bishop, I offer all my prayers and efforts to include and foster the ministries of every person seeking to serve Christ. No matter how you are feeling about the conversations going on at the global level of our denomination, I want you to know that every one of us and everyone we serve are of infinite value and matchless worth in God’s eyes. No denominational legislation will ever change that fact. Third, we still have much important work to do together. While we were gathered in St. Louis, the need for a faithful United Methodist witness in Rio Texas has only grown greater. Across our annual conference, there are multitudes that need to hear and witness the love of God in their lives and communities. While we debated plans and passed motions, our members and churches have been continuing the good work of reaching out to new people in new ways. Our disaster response network continues to bring hope to those lives devastated by Hurricane Harvey and other natural disasters. Our churches and partners continue to respond to the humanitarian crisis at our border. Our congregations continue to seek fresh expressions of the Gospel, reaching out into our communities and experimenting with new ways to go where people are to connect them with the good news of Christ. I realize that, for some, these words will ring hollow. Many of our LGBTQ brothers and sisters question whether there is truly a place for them in our church, and many of our traditionalist brothers and sisters feel anxious. But I want to invite everyone—whether or not you agree with the decisions of General Conference—to help us forge a way forward together in Christ as an annual conference. “So now I am giving you a new commandment: Love each other. Just as I have loved you, you should love each other. Your love for one another will prove to the world that you are my disciples.” John 13: 34-35. Join me in prayer that we might continue to bear witness to the love of Jesus Christ in our churches, communities, and throughout Rio Texas. 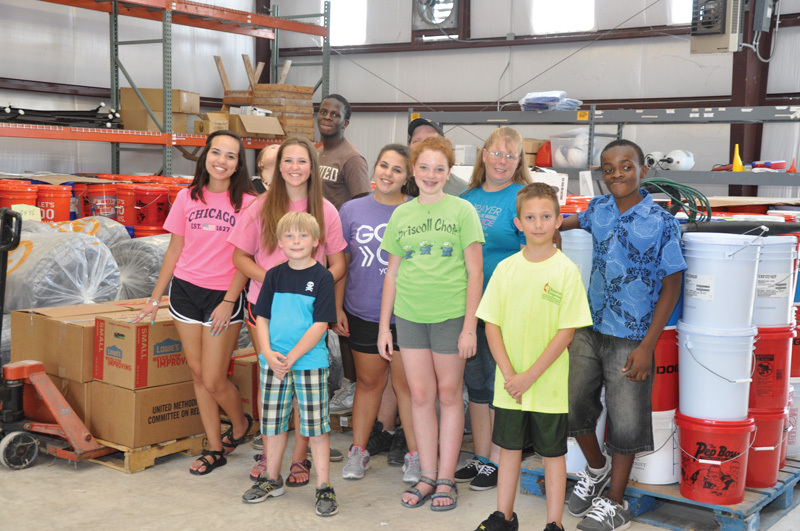 What a blessing it was to be #InRelationship with close to fifty church youth groups from the Rio Texas Conference and beyond as we served nine communities with ten mission opportunities May, June and July of 2018; we completed over 80 work sites including churches, non-profits, residential and Hurricane Harvey impacted locations with the help of 635 participants, Thank You! I am amazed that so many have given an entire week in service to our Lord by helping our neighbors… You are Christ’s hands and feet to so many, thank you! It is time for us to start prepping to be #SentOut in 2019 with College/Young Adult, High School, Middle School, Mixed Age and Family Mission Opportunities. 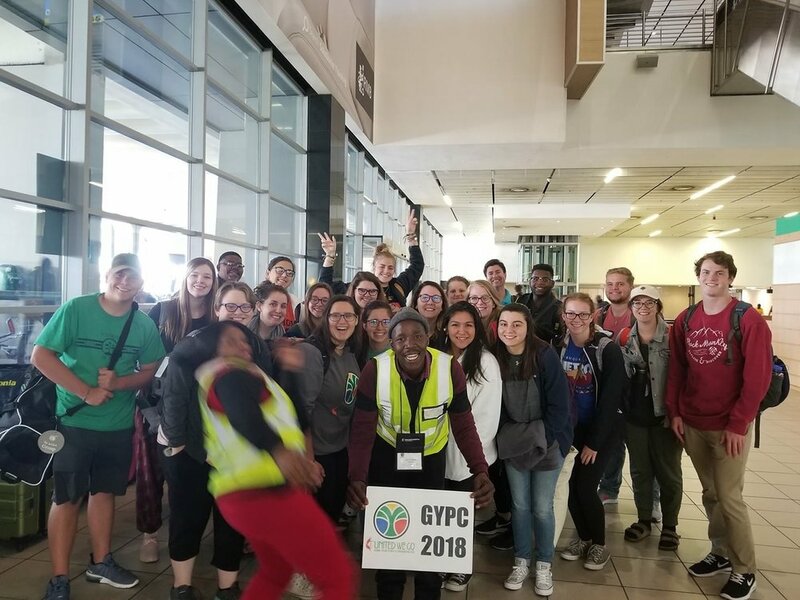 Seven young adult Rio Texas leaders traveled to Johannesburg, South Africa to meet with other leaders from around the denomination at the Global Young People’s Convocation. Participants prayed, listened, celebrated, and discussed different topics during a legislative forum. There were other opportunities for growth and learning during the five-day convocation. Young adult Rio Texas leaders learned from other’s different cultural backgrounds and languages. The leaders were placed in groups to hear different voices on a wide spectrum of issues affecting the UMC. Legislation passed during these hearings will be presented to the 2020 General Conference in Minneapolis. 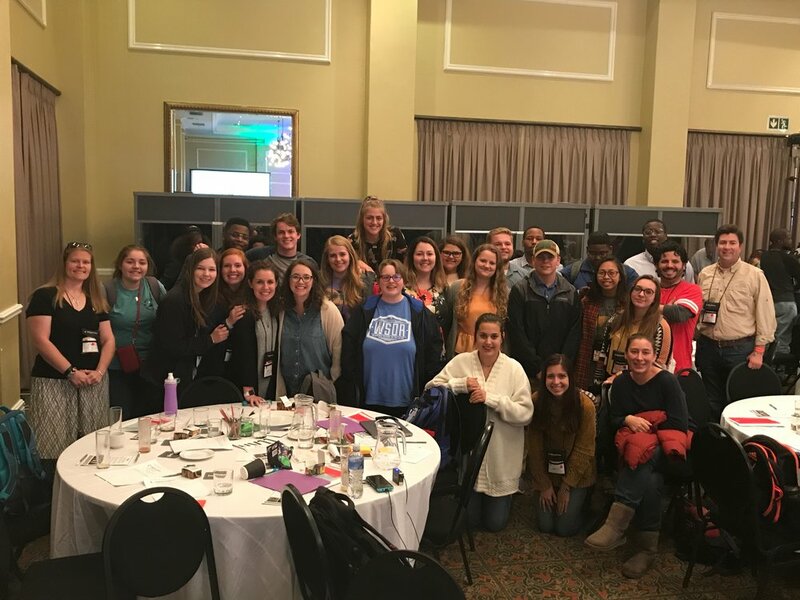 The convocation not only strengthened the bond between Rio Texas and the global church, it allowed for community building within the Young Adult and Youth Ministry Councils. Mission team opportunities are available now at the Martinez Disaster Response Warehouse in Kerrville near Mount Wesley. Help is needed to verify flood buckets so they can be ready for distribution when the next flood hits the Rio Texas Conference. More than 1000 flood buckets are stored in the warehouse but they need to be verified before they can be distributed to flood survivors. UMCOR requires all kits to be checked for verification so that they contain the exact items designated by UMOCR. The opportunity is available to a wide variety of teams ranging from Junior High Youth to senior adults. UMW teams have found the opportunity rewarding. Team size can vary but a maximum of approximately 15 is recommended. Teams that include youth must comply with the Conference Trusted con Confianza Safety Policy. Teams should plan to spend no more than three to four hours in the warehouse on any one visit. Inquiries should be sent to Jack Clarke, warehouse manager for the Rio Texas Disaster Response. Leadership Institute is quickly approaching. We hope you and your church are getting ready to come and learn as a team! Bishop Schnase will be one of the keynote speakers, so it would be wonderful to have a large group from the Rio Texas Conference. 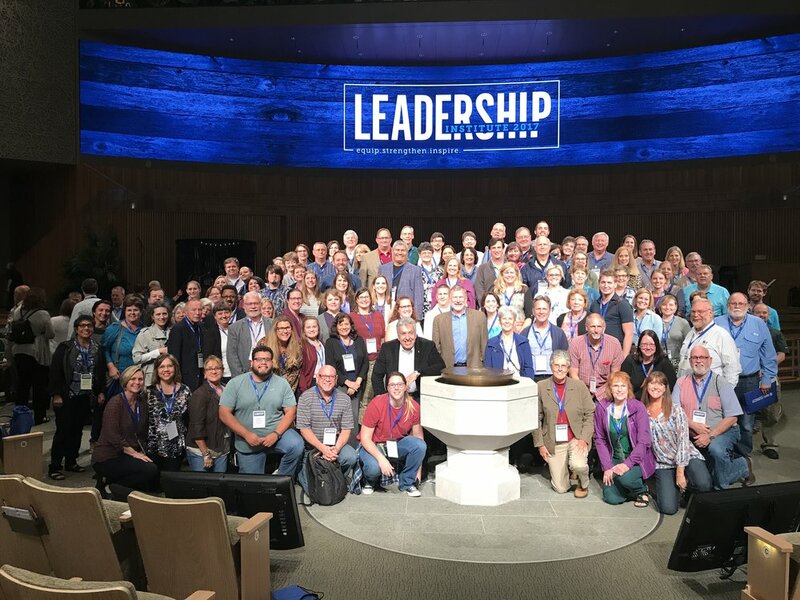 COR is requiring that if a Conference is getting a reduced rate, each church registering will need to turn in to the conference office a written paragraph or so about the expectations for leadership development in the local church. In other words, how will you use the conference to further develop leadership in the local church? All Clergy and 2 lay people from each church may register via the discounted rate. The Rio Texas Conference will pay for the registration fee. NOTE: More are allowed to register, but not under the reduced rate. The individual or church will need to cover the cost for the additional people. From the website, li.cor.org, select Registration from the top menu. Advise the group to scroll down the page and read through the Registration Tips prior to registering so they’ll have all the information ready to enter. If a registrant completes only part of the registration before completing the payment section, their registration won’t be complete and they won’t be registered. After reading through the Tips, they can select the Register Now button. After entering their Name and email address, they’ll need to select ShareChurch Registrar Group from the dropdown menu for Registration Type. Please note: The group registration is for the main Leadership Institute workshops only. If you want to attend the pre-institute workshops, you must pay for these courses separately. Besides paying for all clergy and two lay people from each church, clergy may turn in travel/hotel reimbursements for up to $150. All original receipts will be needed. Karen Horan will have the forms at the Leadership Institute for you to fill out. You can hand them in or mail them in at a later date. Since MHM covers the clergy portion, a follow-up survey must be completed before reimbursements will be mailed. Of course, you may bring more than three church members, but they would go through the “regular” registration process. If you have any questions, please contact Karen Horan at khoran@riotexas.org or Eve Albert at evealbert@riotexas.org or 210-408-4551 in the conference office. Join us from 9:00 am -4:30 pm on Saturday, September 15 at Coker United Methodist Church. Are you wondering why so many people are talking about the Enneagram? What is that strangely-shaped star? Or maybe you have never heard of the Enneagram at all, but you seek to grow in your faith and well-being. While not an exclusively Christian tool, many Christians have used the Enneagram wisely and well to draw closer to God. Wherever you're starting from, you're invited to an introduction to this profound way of looking at who we are and our paths to spiritual growth. More than 6000 homes were affected in late June when torrential rains caused widespread flooding in the Rio Grande Valley, especially in Weslaco, Mercedes, and Pharr. The full extent of the damage and need is still being assessed. According to current FEMA registrations, 8457 homes have been damaged and 1662 destroyed. Dionisio Salazar presented the resolution to 1500 members of the UMC at the American Bank Center. CORPUS CHRISTI (Tuesday, June 12, 2018) – The Rio Texas Annual Conference of the United Methodist Church passed a resolution on June 9 to formally request the US Department of Justice to cease the separation of immigrant children from their families. Robert Schnase, Bishop of the Rio Texas Annual Conference, presided over the motion during the Annual Conference to address the humanitarian crisis affecting children held in detention centers located across South Texas. 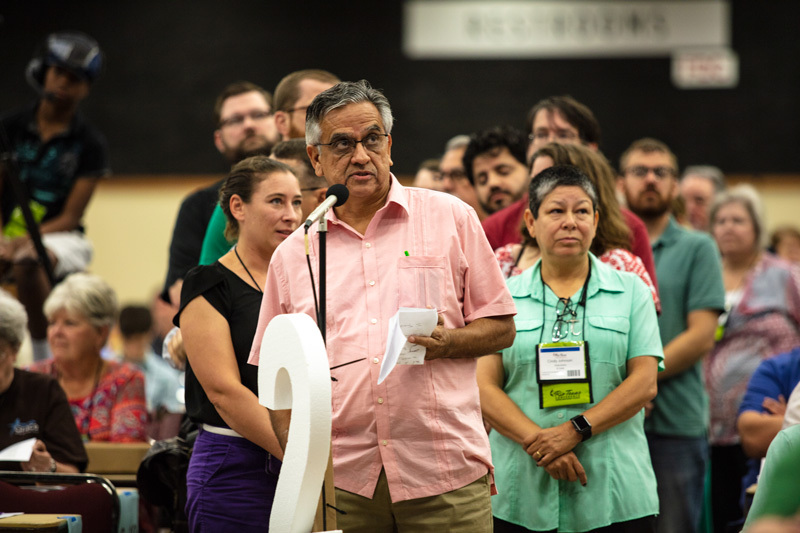 1500 lay delegates and clergy voted overwhelmingly to support the resolution to end family separation. The Rio Texas Annual Conference meets every June at the American Bank Center in Corpus Christi, Texas to conduct the business of the United Methodist Church for the Rio Texas region that spreads from north of San Angelo to the Rio Grande Valley in the south. This is the fourth gathering since the former Southwest Texas Conference and Rio Grande Conference merged to become the Rio Texas Annual Conference in 2015. The Rio Texas Annual Conference aims to reach out to people of South and Central Texas. Some of our churches are located in some of the fastest-growing areas of the country. Others are located in areas where people are struggling with issues of poverty, lack of affordable housing, and a loss of hope. We are committed to providing vital missions, vital congregations, and strong leaders to connect our churches to the people. Our churches are in large cities and small towns from Austin to McAllen, from San Angelo to Victoria in vibrant cities, historic small towns and struggling communities. Our Bishop is Robert C. Schnase. He was assigned to Rio Texas in 2016 after 12 years in the Missouri Annual Conference. For more information about the conference or our bishop, please visit http://riotexas.org and follow us on Twitter @RioTxAC.